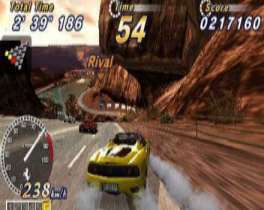 Sega's Outrun 2006: Coast 2 Coast for the PSP is a solidly entertaining arcade racer that brings the classic racing series up to date with improved graphics, multiple courses and other additional features. Added modes such as time attack, heart and multiplayer options add to the fun. This conversion does an excellent job in bringing the arcade game to the handheld. While it's not the deepest racer on the market, Outrun 2006 is a solidly entertaining title that should please fans of the genre. Taking players on the road through the highways of America, Outrun 2006 allows you to drive a number of cool Ferraris through a variety of courses based on real locations throughout the USA. The game is a bit deeper than the original version, and allows you to set up a license to keep track of your progress, and save your earned bonus features. This is a really cool feature, which has added benefits beyond the usual. The gameplay should be familiar to most gamers out there, but we'll briefly describe the action. Like the classic arcade game, the courses branch out in a number of routes, with each fork in the road allowing you to choose either Left or Right direction. In the standard racing mode, the driving is fairly straightforward, and resembles the original closely, but the new twist here are the drift mechanics, which add a degree of realism to the proceedings without making things to difficult. Those players familiar with Ridge Racer should feel right at home with the controls and overall feel of the game. Outrun 2006's gameplay is straightforward and simple, with a traditional formula of being easy to learn and hard to master. The game is fairly easy to beat on the earlier levels, but later levels become much harder, which less margin for error as you progress through the game. You can recover from crashes, but they'll definitely affect your score. The trick in the game is to minimize your time by using the drift mechanics and turning tightly to shave seconds off your time, which isn't as easy as it sounds. This isn't a simulation, and the physics are quite simple, which should keep things accessible for most players. The game's overall feel and structure is highly reminiscent of the original, making it a pleasant trip for nostalgic gamers. However, Sega has added a number of cool additions to the game. The first is an added mode where you can play the complete original Outrun 2 SP arcade game. While this doesn't have any extras, it adds an entirely new set of tracks to play. In the main game, there are a number of extra modes, where you can race all the tracks consecutively, with a total of over 30 stages in all. You can race a number of special modes where you can collect Hearts by performing moves such as extended drifts, driving through cones, passing vehicles and more. These mini-games can be strung together to unlock additional content such as new cars, extra courses and other items as well. This gives the game a much higher degree of replay value, adding to its addictive nature. 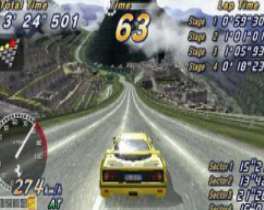 In addition to Outrun 2's addictive solo experience, The game also supports a number of multiplayer modes, which can be played using the Wi-fi connection to play online. There are a number of online modes that allow you to race including the standard racing and mini-games as well. 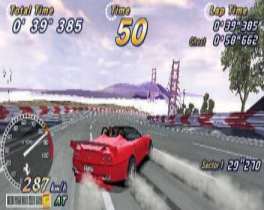 This version of Outrun 2006 can also interact with the PS2 using the USB cord, which allows you to trade data and standings if you own the larger console version as well. Players can trade their license data and use this to unlock even more additional features and items using this cross-connectivity feature. From a visual standpoint, the game does a good job of bringing that classic AM2 feel to the PSP. It's presentation and style will be immediately familiar to fans of the series. Players will find that the game's look and feel has been updated as well, with a decent looking graphics engine that makes playing the game a breeze. There's a nice variety to the courses which range from city streets, seaside villages and mountains, with both day and night racing. The graphics look razor sharp and the game runs at a smooth frame rate throughout. While you're driving, you'll hear a number of classic Outrun tracks, remixed version and several new songs as well, all of which make for an upbeat accompaniment to the action. 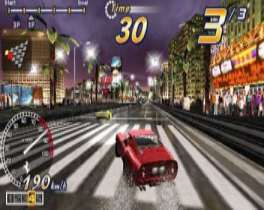 Outrun 2006's visuals and soundtrack are excellent and up to Sega's typically highly polished standards. If there are any faults with the game, they lie in the game's basic premise. While the game is enjoyable in short bursts, things do tend to become a bit monotonous after about an hour. Of course, the added features extend the replay value, but the game is at its heart an arcade game, and thus not designed for extended sessions. That said, for what it is, Outrun 2006 is a superbly crafted title that offers plenty of enjoyment and excitement in a small package. This style of game is perfectly suited to on-the-go play, and this mitigates these problems to some degree. Even though Outrun 2006s arcade-style and simple play mechanics aren't designed for long-term play, it's an addictive, and enjoyable game that offers a pleasant diversion on the PSP.